Moving the Needle: Of course Miguel Cabrera was going to bring home the winning run with the bases loaded, +.340 WPA. Neftali Feliz pitched in both Sunday’s and Monday’s games and was probably not available in this one. Or, at least, not available in a tie game on the road. Feliz’s absence left the 4-4 tie in the hands of Darren O’Day, and, somehow, kept it in his hands as he loaded the bases and had to face Miguel Cabrera, who, if you haven’t noticed, has been hitting covers off baseballs. We were two balls from shrimp, but Cabrera mooted that point when he socked a single and ended the affair. Yes, Josh Hamilton got hurt in this one. Yes, he shamelessly blamed his third base coach. He’ll have a couple months to think about that. Ryan Raburn: 2 for 4, 1 2B, 1 BB. He also made a tremendous catch to rob Young of a home run. A sac fly was all he’d get. Moving the Needle: Ryan Howard takes one the opposite way, +.109 WPA. A lopsided game and the losing team has the high WPA mark? How can that be? When the opponent’s tying run also costs them one of their 27 outs. 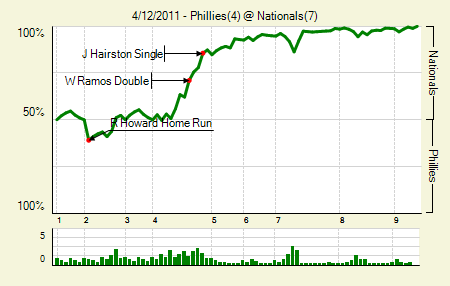 Danny Espinosa hit a sac fly in the bottom of the second to answer Howard’s run, but because he also spent the team’s second out of the inning, he added only .012 to his team’s win expectancy. Then, for some reason, Wilson Ramos’s go-ahead RBI double in the fourth registered only .089 WPA. Jayson Werth: 2 for 3, 1 2B, 1 HR, 1 BB. He’s probably just pissed that he grounded out in his first AB. Livan Hernandez: 6.2 IP, 7 H, 1 R, 1 ER, 0 BB, 6 K, 1 HR. When all you surrender in 6.2 is a solo homer to Howard, that’s a good start. It’s even better for Livan, who actually picked up a few strikeouts in this one. Moving the Needle: Nate McLouth’s double scores Prado from first, +.135 WPA. A key for the Braves offense this year was getting McLouth back on track. While that hasn’t quite happened yet, he did open the scoring in last night’s game. With Martin Prado standing on first, McLouth sent a ball to the 390 mark in right-center. Not only did he drive in a run, but he scored from second base when Chipper Jones added a follow-up single. 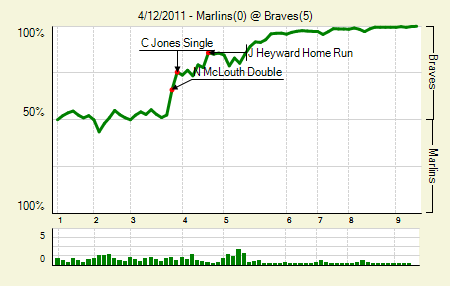 And then the Braves piled it on some more. Tommy Hanson: 7 IP, 4 H, 0 R, 2 BB, 5 K. He got hit around in his first few starts, so it’s nice to see a return to form in this one. He had more strikeouts in this game than in his previous two starts combined. Brian McCann: 1 for 4, 1 HR. Believe it or not, that was his first of the season. It’s pretty safe to say that there are plenty more to come. Moving the Needle: Johnny Damon slaps a bases-loaded single, +.147 WPA. For four innings, it looked like a typically dominant Jon Lester start. He had struck out seven in that span, including the side in order in the fourth. 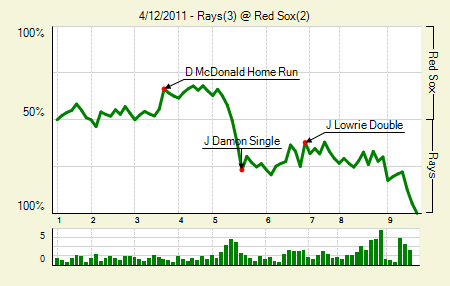 But in the fifth, the Rays put together a little rally. Kelly Shoppach, Dan Johnson, and Elliot Johnson all singled, loading the bases with one out. Sam Fuld, folk hero, had a chance to enhance his legend, and, really, he took advantage. It was a swinging bunt, but everyone was safe and the Rays had tied it. Then Damon, as Damon will do, stuck his bat head out and slapped one up the middle, plating two more. It was a slim lead, but it held the rest of the way. Dustin Pedroia: 1 for 3, 1 2B, 1 BB. He’s 10 of his last 19 with four doubles, a homer, and five walks. David Price: 7.2 IP, 5 H, 2 R, 2 ER, 2 BB, 3 K, 1 HR. He definitely looked a bit better than his fielding-independent numbers might suggest. Even when he was missing he was right around the plate. 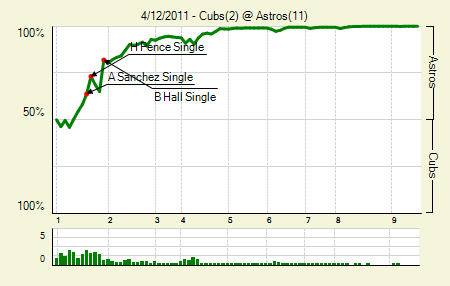 Moving the Needle: Bill Hall, Alfonso Soriano, and Darwin Barney put the ‘Stros up by a trey, +.168 WPA. Hall’s single over the head of Starlin Castro was going to widen the Astros’ lead anyway, but the Cubs helped them add another. First, Soriano let the ball go through the ol’ wickets. He caught a break, though, because that prompted Hall to try for second, where he clearly wasn’t going to make it. Barney to Carlos Pena, then back to Barney — who missed the tag and allowed Hall to reach second safely. Hunter Pence sneaked home on the play, giving his team a 3-0 lead. Brett Myers: 7 IP, 8 H, 1 R, 1 ER, 0 BB, 5 K, 1 HR. That’s four runs, three earned, in 21.1 IP this season. Angel Sanchez: 4 for 5, 1 2B. A hot little start (17 for 50, 3 XBH) for a guy who had basically no expectations coming into the season. Moving the Needle: The Justin Upton hits the go-ahead home run, +.247 WPA. For a couple of innings this was a close one — though I’m using the literal definition of couple here (because, apparently, couple can also mean more than two). With two on and two out in the bottom of the second, Upton crushed one onto the promenade behind the seats in left. 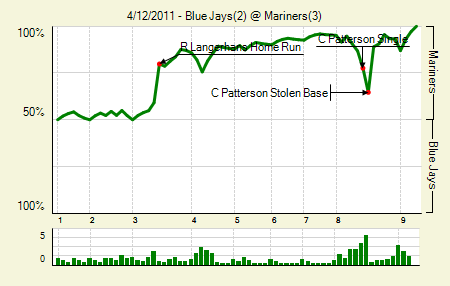 Hit Tracker had it at 478 feet, which broke open the game a bit. 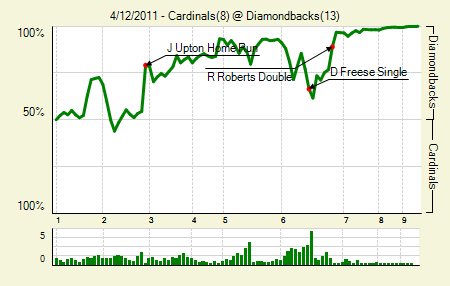 The Cardinals did mount a comeback, getting as close as 9-8, but the Diamondbacks were having none of it. They answered right away with four more runs, putting the Cardinals right back out of it. Chris Young: 3 for 4, 1 HR, 1 BB. Amid all the clobbering he’s been doing (10 XBH on the year), he’s apparently forgotten to stop and draw some walks. Last night he drew only his second of the season. Russell Branyan, Miguel Montero, and Ryan Roberts: All 2 for 4 with 1 2B, 1 BB. Individually they’re probably not getting notable spots. But all three with the same batting line? Why not? Moving the Needle: Peter Bourjos hits his first homer of the season, +.127 WPA. A pair of solo homers was all the scoring this game saw. Bourjos got things started to lead off the third, lining one to left that managed to clear the short wall near the corner. In the seventh Mark Trumbo gave the Angels some insurance when he belted his first career homer. 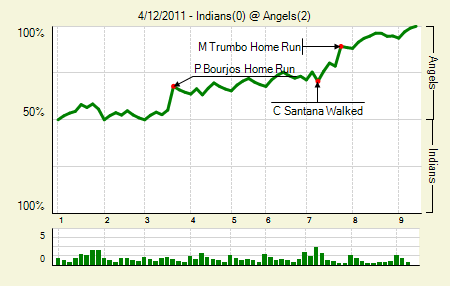 Trumbo’s homer was also down the left field line, but he got a bit more of his, sending it more than a dozen rows back. Dan Haren: 9 IP, 1 H, 0 R, 2 BB, 8 K. That’s all we got? One goddamn hit? Haren was filthy again in this one. Was there a better trade last year than the one that sent Haren to the Angels? Fausto Carmona: 7.2 IP, 4 H, 2 R, 2 ER, 3 BB, 6 K, 2 HR. He also got 14 ground balls to 7 fly balls. That’s Carmona when he’s on. Any other night this would likely have been a winner, but there’s nothing he can do when the opposing pitcher is just a little more dominant. 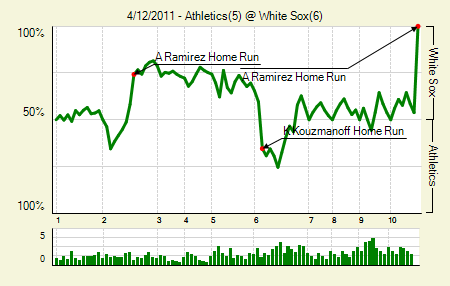 Moving the Needle: Alexei Ramirez wins it with a walk-off bomb, his second of the day, +.462 WPA. The Sox took an early lead in this one, but the A’s caught up and took a lead in the middle innings. After the Sox tied it in the sixth, they went back and forth with scoreless innings, though the A’s did have a good shot in the ninth, with a runner on second and one out. It took an extra frame to figure out this one, and Ramirez ended it with a no-doubter off Bobby Cramer. 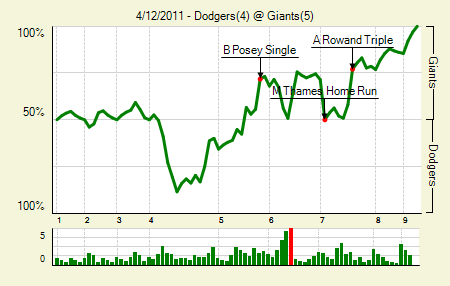 This game really was all Ramirez, as he went 2 for 4 with a walk and drove in four of the team’s five runs. Trevor Cahill: 4.2 IP, 6 H, 4 R, 4 ER, 3 BB, 3 K, 1 HR. The A’s provide you with financial security, and this is how you show your appreciation? 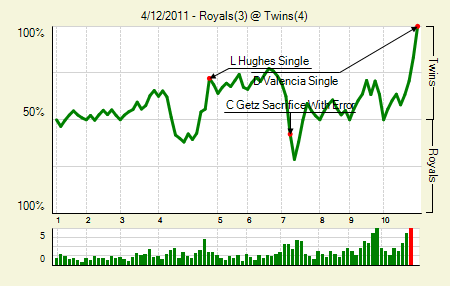 Moving the Needle: Brian Duensing’s error on Chris Getz’s bunt sets up the Royals, +.202 WPA. It’s another quirky WPA alert. 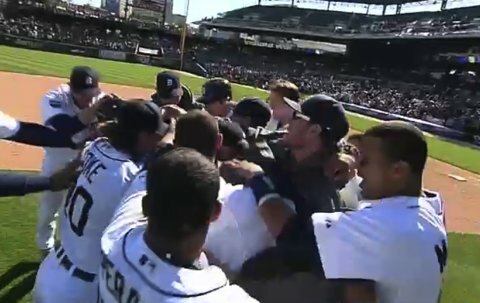 Somehow the walk-off hit wasn’t the big needle-mover in this one. After all, when Danny Valencia broke the tie in the bottom of the 10th, the Twins had bases loaded with one out, so their win expectancy was already at 83.3%. The Royals actually put themselves in a good position to win the game in the seventh. With a runner on first with none out, down by one, Getz laid down a sac bunt that Duensing fielded. He turned and threw to first, but it went sailing over Justin Morneau’s head, which put runners on second and third with none out, increasing the Royals’ win expectancy to 57.7 percent (despite the fact that they were losing). Melky Cabrera then tied it with a single, but the bullpen came in to shut down the Royals while incurring no further damage. Michael Cuddyer: 4 for 4, 1 BB. Yep. They were all singles. Odd for a guy like Cuddyer, who has excellent power against lefties. Moving the Needle: Ryan Hanigan breaks the tie in the 11th, +.417 WPA. 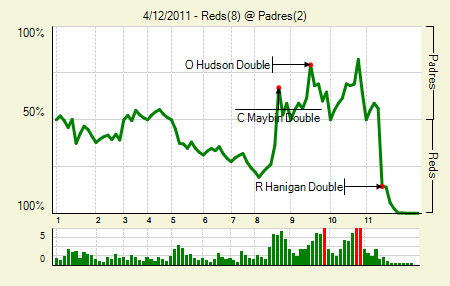 The Padres had a chance to cash in a half-inning earlier, when they had bases loaded with one out in the 10th. 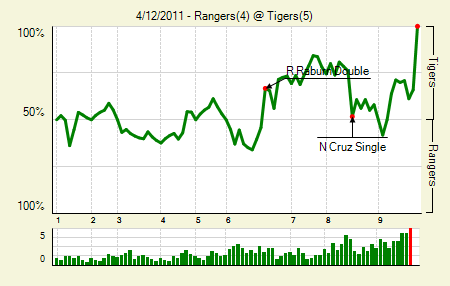 A strikeout and a fly out ended those chances, moving their win expectancy from 82.3% back to 50%. The Reds made two quick outs to start the 11th, but a pair of singles and a double plated the first extra innings run of the game. A walk and two singles made it a 5-2 game, and a Drew Stubbs homer added another three, putting this game effectively out of reach. Sam LeCure: 6 IP, 1 H, 1 R, 1 ER, 2 BB, 8 K, 0 HR. Eight Ks through six and they pulled him. The reliever, though, was Aroldis Chapman, who, surprisingly, struck out two in his inning of work. I say surprisingly, because if the soft-tossing LeCure can strike out eight in six innings, I’d expect Chapman to strike out the side in order. Clayton Richard: 7.2 IP, 5 H, 2 R, 1 ER, 2 BB, 4 K. He did everything in his power, and so did the bullpen. That is, until Cory Luebke. Moving the Needle: Corey Patterson ill-advisedly tags up, gets caught, -.243 WPA. It appeared that the eighth inning was the one in which the Blue Jays would mount their comeback. They had trailed 3-0 since the third, but finally started putting something together late. With runners on second and third with one out, Patterson singled home both to bring the Jays to within one. A steal and an error put him on third, but Jose Bautista popped out to foul territory behind first. Justin Smoak made the catch with his back facing the infield, which apparently prompted Patterson to attempt the tag-up. Smoak made a good throw, and Patterson was out by a lot. Miguel Olivo even gave him the “you idiot” bump at home. Michael Pineda: 7.1 IP, 5 H, 2 R, 1 ER, 2 BB, 7 K. He does allow a ton of balls in the air (8 FB, 4 LD, 2 GB in this one), but with overpowering stuff he compensates well. It’s just two starts, but he’s looked like a budding star so far. Ricky Romero: 8 IP, 5 H, 3 R, 2 ER, 1 HR, 2 BB, 8 K. We saw a few hard-luck losses yesterday evening. It’s always a shame to see a guy pitch this well — with a complete game, no less — and lose. He was perfect from the fourth through the seventh, and then worked out of a bases-loaded jam in the eighth. Moving the Needle: Marcus Thames ties the game with a homer, +.215 WPA. Really, Thames provides his teams values in one way: he swings the bat really, really hard, which often forces the ball to travel far, sometimes out of the yard. This one was a no-doubter off Jeremy Affeldt, which makes sense because Thames absolutely mashes lefties, tying the game at four in the seventh. The winning run came in the bottom of the half, when Blake Hawksworth uncorked a wild pitch, allowing the runner from third to score. Talk about anti-climactic. Buster Posey: 3 for 4. All singles, of course. He has just one extra base hit, a homer, on the season. Matt Kemp: 2 for 2, 1 2B, 2 BB. Everyone said Kemp needed to have a big year, and he’s well on his way (.472/.578/.694 so far). He has drawn a walk in 20 percent of his PA so far. We hoped you liked reading The Morning After: Game Recaps for April 12th by Joe Pawlikowski! I like these game write-ups. A nice addition (or maybe I’m just noticing them for the first time this year). I agree. They are great recaps.